I had ridden horses a lot in my life but never with any knowledge or instruction. Galloping and hanging on for dear life on a beach in Punta Cana seemed fine with me. After all, the water and sand would break my fall ;). But as I approach a retreat in Wyoming titled, Literature and the Landscape of the Horse, during which we will not only be writing, learning about the history of humans and horses and enjoying renewal; we will also be assigned to a horse all day for five days as part of the experience. Since I am generally a shy and embarrassed person, I didn’t want to spend those five days in the agony of my embarrassment at horse ignorance, so I asked a friend and yoga teacher who is “mommy” to a superb horse, to instruct me in the finer points of horsemanship. When I first arrived at the barn, I asked to use the restroom. This was a barn, not a fancy stable. 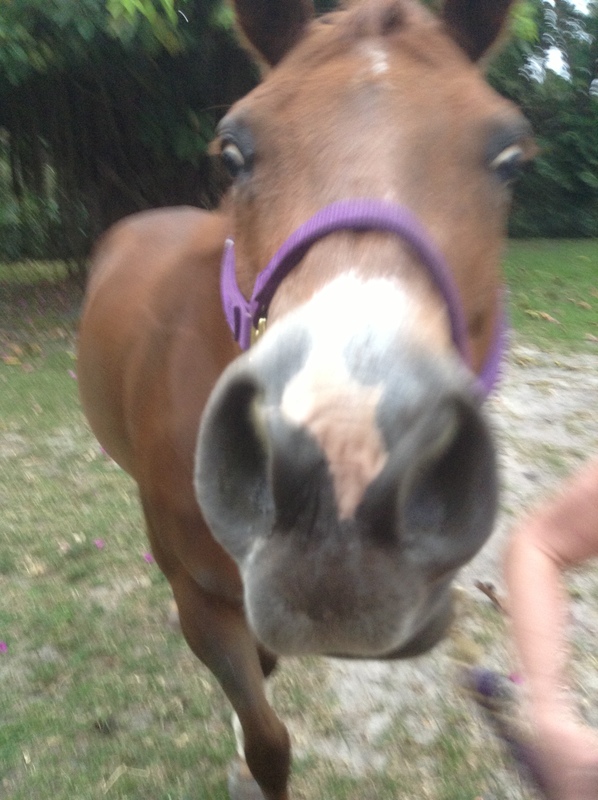 Thus, my first lesson in horsemanship was…and I quote…”Pee in her stall.” What????? I couldn’t possibly. Oh my goodness, no!!!! I may consider myself kind of a rustic-able girl but this was unheard of!!!! Then she demonstrated how to brace yourself against the stall wall and…well…pee. No water, no handi-wipes, no tissue. Just do it. So I did. Liberating!!!!! Now I don’t even think twice about it :). Secondly, when one is mucking out a stall, it is akin to standing in a large cat litter box with a large scoop and taking care of business. Somehow, one’s squeamishness over bodily functions disappears…rapidly. One is searching for “buried treasure”. In the case of Serenity, she is such a princess, that I want her stall to be pristine and covered with clean shavings at all times. Here’s what I learned: a cleaned stall is a clear invitation to a horse to produce…um… more manure. Serenity goes delicately into a corner with a twinkle in her eye, finishes with a satisfied horse groan and there I rush, rake in hand…! Horses are superb in that, when “producing manure”, they lift their tails cleanly and beautifully! What I didn’t know is that they do that when passing gas as well! In Serenity’s case, whereas she’s delicately in a corner for the former…for the latter, she truly enjoys gracing me with her tail lift when I’m, say, cleaning a rear hoof or brushing her rump. Again, with a twinkle and sly look in her eye. Yuck, Serenity!!!!!!!!! Then there’s my now unrecognizable vehicle! I had kept my 13 year old Toyota Rav 4 washed, vacuumed and clear of any clutter. My vehicle was formerly a zen experience. Now? You are likely to find manure laced boots on the back seat floor alongside of a sweaty hat, yoga bag and mat, a huge sack of apples, a huge sack of carrots, a 12 pack of water, certain items I don’t want to keep in the tack room until I get a footlocker to keep them under lock and key (sadly, there are some folk who “borrow” stuff at a barn and don’t return it.) There are bits of hay and grass everywhere, a loose pistachio nutshell or two ( I don’t have much time to eat, so pistachios are my “go to”) and the detrius of driving here and there with no available trash receptacle. My formerly weekly carwash accomplishes nothing anymore so I’ve ceased that exercise in futility. Certainly a “not me” situation but really, more me than ever because I am learning the lesson of being me instead of being an appearance. Lesson Number Two: “Respond with Courage”. I take that phrase from Mark Miller’s simple and profound book, The Heart of Leadership . As my supervisory staff and I studied the concepts in this book, I came to realize that one of the traits of leadership character that I needed to improve was “respond with courage”. I’m such a people-pleaser and “warm & fuzzy” leader that I think, hesitate and analyze before correcting a situation. The results of this have not been optimal. Leave it to Serenity, the horse, to school me in this lesson as well! With a horse, as Buck Brannaman instructs in his book, Believe, it does not help the horse to yield to it. A horse needs to know what its job is. A horse needs to know you’re the leader, without any cruelty, harshness or “breaking”. But by “responding with courage”, in the moment, both human and horse benefit. I began learning this as my teacher improved my rein hands and leg signals. 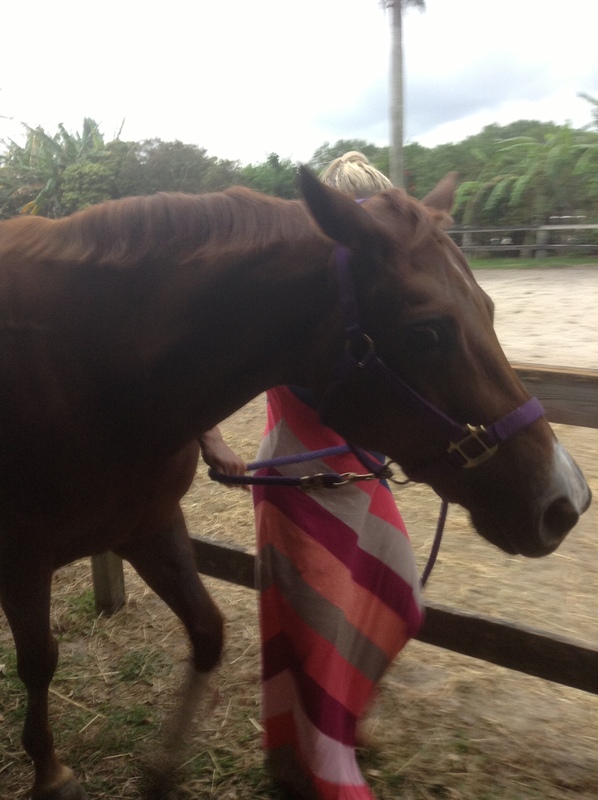 Since her recent nighttime escape injury, Serenity can’t be ridden for another month or so. But she now is able to go for a walk, graze and get her horsie sunbath. When walking her, by responding immediately when she would lower her head to graze and gently but firmly closing in on the lead rope to lift her head, we both benefited because she’d remain walking. When she goes too fast for me, I stop her, say “easy” and start again at MY pace. A huge “respond with courage moment” has come as she and I work on her not exiting her stall in a frantic run and not returning to her stall pushing me aside in her hurry. I have to stop her each time. If it doesn’t go well, we do it again and again. But if I don’t have the courage, as a 5’3″ petite woman, to let her know what we’re doing, I don’t help her and I certainly don’t help me. One of the biggest lessons in “respond with courage” has come as antibiotics have had to be administered as a result of her injury. Just putting the powder in her grain wasn’t cutting it. No amount of added applesauce or chopped carrots or hand feeding her with applesauce, chopped carrots and horsie treats would convince her. So the vet recommended a large syringe with mixing the antibiotic with molasses. At the sight of the syringe, Serenity, already syringe phobic, goes into wild-eyed, horsie panic. Still, the first few administrations were accomplished by me courageously holding her halter and even as she was raising her head, wiping some of the concoction on her lips and front teeth. This lowered her head enough for me to quickly shove the syringe over her tongue and the molasses/antibiotic down her throat….until last Sunday. This day she had finally HAD IT! I would hold her halter but she kept pulling me up off the ground into the air with the ferocity of her lifted head. My sweet fella, who was with me, marched right in, grabbed her halter, looked her in the eye, said “Easy girl or I’ll pull you down”in a courageously firm voice 🙂 and she meekly lowered her head and I did the molasses/antibiotic squirt. Now THAT was responding with courage! I learned so much by watching his definite, firm but kind action. Still, the next day, when alone with her, I was wise enough to know I hadn’t reached that level of “respond with courage” yet. So as Serenity and I gazed at each other. while I was figuring out how to get this last dose into her…a small, horsie-accented voice in my head said, “Maybe if you cut an apple in half and cored it, stuck the nasty concoction in the center, put a ‘nickerdoodle’ on top of that, covered that with more molasses and stuck the apple back together again, maybe just maybe I’d eat it.’ I did and she did :). Not as courageous as my fella, perhaps, but that leads me to the third lesson. Lesson Number Three: Horses are ONLY capable of being honest and you must be too. You must be absolutely openly and honestly YOU or there will be no true communication. By admitting to myself that I still had a lot to learn about dealing with a 1,000 pound animal who is resisting a syringe and that I was NO Buck Brannaman, I opened a channel of communication with Serenity. She actually was able to demonstrate to me that if I would lose that nasty syringe and offer an irresistible presentation of the dreaded antibiotic that she would honor my honesty about my” green-ness” with a suggestion of her own. Indeed, if one just stays present and quiet…if one just observes the body language of a horse…if one stops their infernal multi-tasking and does each horsie task as it comes…a horse will tell you everything about itself that you need to know. I sit in a place of honesty with Serenity because there is no other acceptable option. In that place of honesty, I am confronted with all my own beauty, power, weakness, silliness, fear, courage,intelligence, sensitivity, hyper-sensitivity, shyness, open-mindedness, close-mindedness, stubbornness, compassion, and passion. And there she is with her sensitive, intelligent, complicated, prey animal self with all her quirks but open and trusting with me. I am an improving human. She is a perfect horse. This entry was posted in Personal Growth and tagged Cleanliness, Communication, Courage, Honesty, Horses, Horses Horses, Neatness, The Heart of Leadership. Bookmark the permalink. Thank you for your encouragement. I KNOW it’s a big endeavor but I figure if I’m doing God’s will, that I will be made strong enough to be able to deal with the fundraisers and “headache” stuff that this endeavor would bring. Also, I’m going to start small. Our exchange today has already given me such a lift. I truly appreciate it! 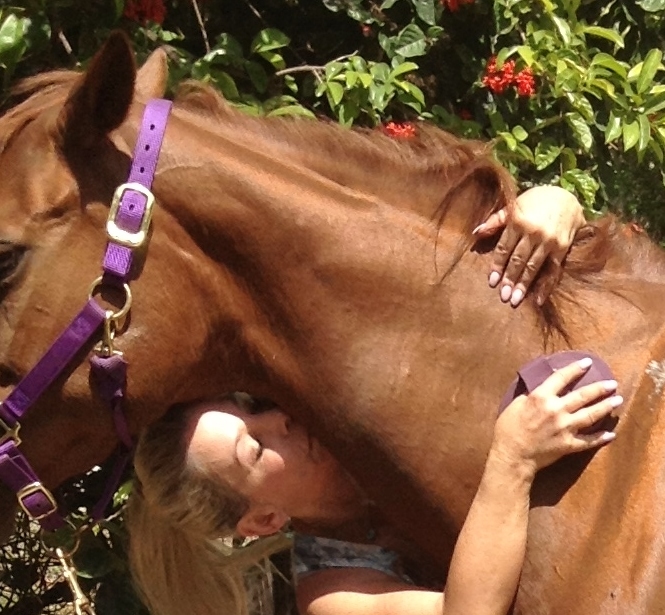 My autistic son Luke rode horses for 10 years. I took him faithfully to Little Bit therapy center every Thursday evenings. It brought tears to my eyes how he and the horse grew to know each other. This is uncanny because I’m going to start volunteering at a place here in FL to learn how horses & autistic children interact. My nephew is autistic. I am slowly putting pieces together to create something like you had for your son. Thank you for your beautiful comment. Also uncanny, I was just working on a post about tears when I saw your comment…thank you again! Great minds think alike! God bless you! That is a huge endeavor! I know they have had to do huge fund raisers, and they have received big donations to keep afloat!